A tropical oasis in the heart of Kuta, four-star Ramada by Wyndham Sunset Road is the perfect getaway for those wanting a boutique style hotel close to cafes, surf beaches, shopping and nightlife. Choose to explore Kuta’s scenic surrounds, indulge in the region’s authentic cuisine, or laze in comfort at either of the hotel’s pools. Your Bali holiday can be as relaxed as you want it to be. The Superior Rooms feature a private balcony, separate bedroom and ensuite. 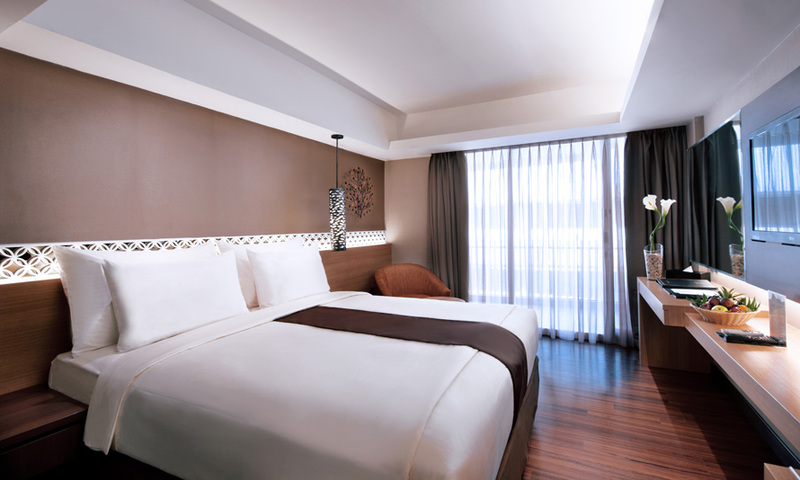 All rooms are decorated to provide a relaxing and peaceful environment. The Deluxe Rooms are located on the higher levels of the resort, featuring a private balcony where you can enjoy the natural beauty of Indonesia’s famed sunsets. The rooms also include a separate bedroom and ensuite. All rooms are decorated to provide a relaxing and peaceful environment. Ramada by Wyndham Sunset Road is a 4-star hotel located on famous Sunset Road. The resort is a tropical wonder offering guests a great location to explore the surrounding areas. 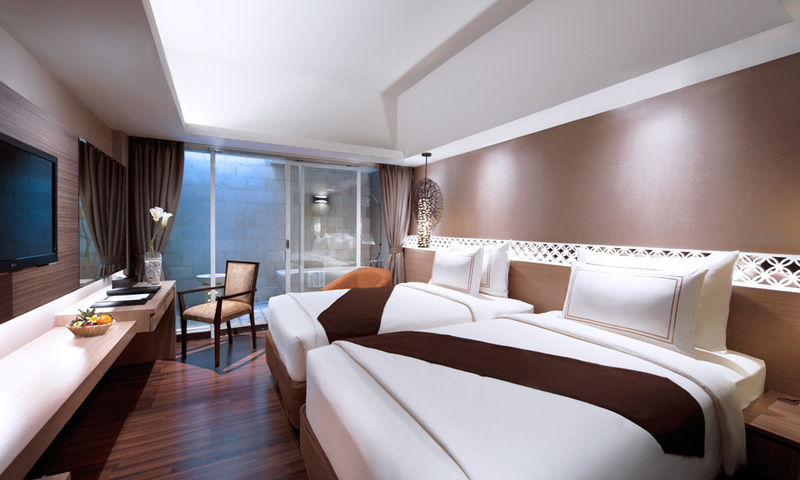 Ramada by Wyndham Sunset Road hotel is located on the famous Sunset Road, Kuta just 3.8 km to Kuta beach, 4.5 km to the Seminyak region, nightlife and shopping area. The resort is within easy access to Bali’s famed tourist attractions and just seven kilometers from Bali International Airport. Please note: additional charges may apply. Today depart from either *Sydney, *Melbourne or Brisbane for Bali. Fly with Jetstar including 20kg baggage. Upon arrival you will be met and transferred to the hotel. Today is free to spend at leisure. Today at the appropriate time you will be transferred to the airport for your return flight back to Australia. Please note: Due to flight scheduling, some flights may arrive back in Australia +1 day later. Travel offer is valid for travel on selected dates until the 2nd December 2019. This travel offer is priced for two people based on twin share. For solo travellers no discounts apply (twin share purchase must be made). Jetstar and codeshare partners (subject to availability). Please note: One way flights can not be accommodated. Travelers must take all included flights within the package, and any flights intentionally forfeited will result in later flights being subject to cancellation. 1 x Double bed or 2 x Single beds (subject to availability). - Visa fees and requirements (A tourist visa for Bali is not required if traveling on an Australian passport). 1 x dinner dining experience at Sandekala Restaurant is valid for food only and includes a buffet style meal. A Tourist visa is not required in Bali for stays up to 30 days; provided the arrival and departure in Indonesia is from Ngurah Rai, Bali or other airports located in Indonesia. Please refer to www.visasdirect.com.au for further information. Visa Exemption is NOT permitted for holders of Temporary or Emergency passports. Please note: Passengers who are not Australian citizens must check with the respective consulate or visa agency to determine what their visa requirements are and what personal identification is required. It is also important to note, some areas of employment such as journalism, government authorities and charity organisations may have additional restrictions in applying for Visas. This may in turn affect the type of application required. · 1st Change - $100.00 per person + any additional charges applied by the airline/accommodation/other travel provider. · 2nd Change - $150.00 per person + any additional charges applied by the airline/accommodation/other travel provider. · Subsequent changes - $250.00 per person + any additional charges applied by the airline/accommodation/other travel provider. · Changes within 30 days of departure $350.00 person + any additional charges applied by the airline/accommodation/other travel provider. · Changes within 14 days of departure $500.00 per person + any additional charges applied by the airline/accommodation/other travel provider. · If the incorrect name has been advised to TripADeal, charges of $150.00 per person + any additional charges applied by the airline/accommodation/other travel provider will apply.